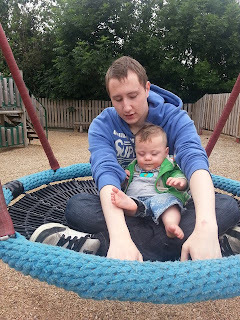 On Wednesday I took a trip to Cannon Hall Farm along with Liam, Emily & baby Finn and Jared. The weather was lovely hot but not too hot. We took a little picnic with us, mainly because when you have children you never know what they will eat or when they will eat. 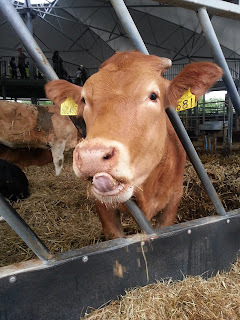 So anyway in the farm is a nice selection of animals we went to see the cows at the roundhouse first. I took Jared up the steps so he could look down onto the cows and I'm so sorry for the poor cow that ended up with Jared's sick on it's side. 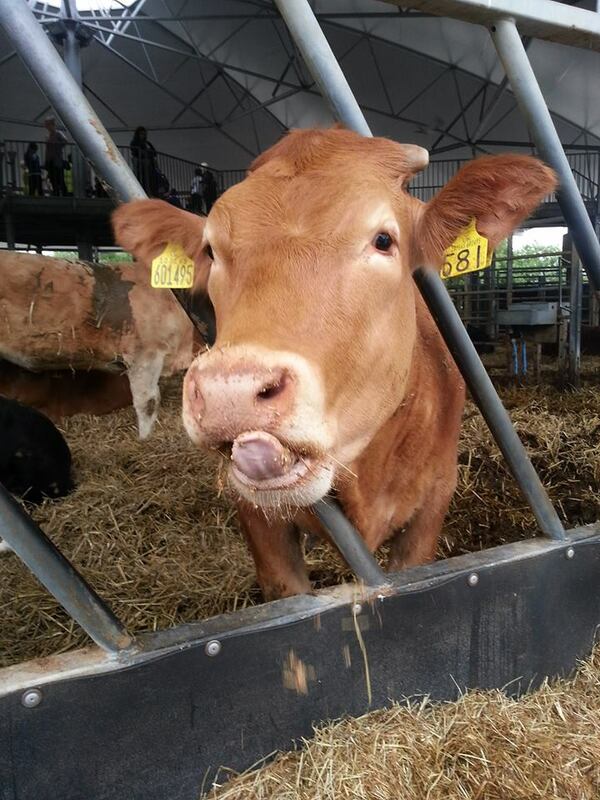 I took an amazing picture of one of the cows that tried to lick me (I would of let it but I thought it might nibble my hand). This is the cow I was talking about I have named it Trudy not sure if she already has a name if so please let me know. This picture is now one of my favorite picture I have ever taken. Now I love sheep they are my favorite animals apart from dogs, so I got a bit excited when I read that there was sheep racing. Although the race is short it is such good fun. There are four sheep and you get a free bet where you choose what sheep you think will win I chose yellow (Mutton Chop) they give you a raffle ticket and if your sheep wins you then have the chance to win a trip back to the farm, at least this was the prize on the day I went I'm not sure if they change this?! Another race that takes place is the ferret race again you can bet and have a chance to win. This next part makes me seem like such a soppy soul, we went round to look at the rest of the animals (goats, llamas, sheep and pigs) as I walked into the pig pens I saw all the piglets and pigglers (toddler pigs to me). I reached these pigs and they looked at me and I was tapping the wall and calling them over this one piggler came over to me and actually sat like you expect a dog to do. I got all soppy and I fell in love with this pig I gave behind the ears a little scratch and I was sad to leave that piggy as it was adorable. The farm also has a variety of rabbits, guinea pigs and chickens which you can pet in the petting area where a member of staff will pick one up so you or your little one can have a little stroke. As the babies were getting a bit restless we went over to the park, after Emily, Liam and me had a go on the zip wire/line swing. I like that there is more than one park which means the littlies can have a play with out big kids getting in the way. Jared was getting very grumpy so we put him on the swing with daddy but he still wasn't that amused. Because both babies were getting restless we decided that we should have a look around the shops and then head home. There is a gift shop where you can buy a selection on mementos to remember your trip but they also sell other little gifts in there like books and toys. I was very eager to get to the farm shop as I had been told that the food was nice and good quality. We bought some venison sausages which we had later on that night, some paprika & pork sausages fudge and banana biscuits for Jared. I was a little nervous about trying the venison sausage as it isn't your normal routine meats like beef and chicken, we had them with some potato wedges as I didn't wanted a sauce to ruin the flavour. Wow!! I was surprised they were really nice kind of had a cumberland or lincolnshire sausage taste too them (I can't say which as I always forget which is which lol). The fudge was consumed in one sitting and we have one of the very tasty biscuits left we are yet to taste the other sausages we got. So if you are around the Barnsley area and looking for a day I would totally suggest Cannon Hall Farm it is great fun and reasonably priced, I think it could be better if they offered feeding lambs as I know some farms do offer this. I'm now planning my next visit back to the farm but will be going with my Mum and my two little sisters. I'm sure I will buy more yummy food and share my thoughts with you all. Please leave a comment if you have visited and what you thought or if you have bought some produce, what did you get? was it good?